There is a certain level of machismo in South America and that goes for Bolivia too. Men are supposed to be patriarchs – masculine, strong and stubborn. They work, while women take care of the home, the meals and the children. This is obviously a highly generalizing statement, but there is some truth to it – especially in rural Bolivia. The men are usually the sole providers but they aren’t always responsible with their salaries and often have a one too many cervezas after work. 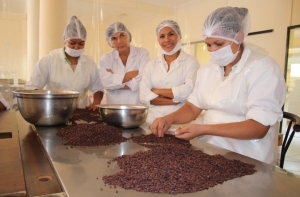 Sumar and Oialla hire women to process the cocoa. This sounds perfectly normal and it is. Just not in rural Bolivia. However, our experience shows that the women of Baures are excellent workers, more responsible with their salaries and very dependable. While the men challenge the rough terrain to find and harvest the cocoa, the women handle the drying and packaging of the beans. The children attend school and help with small tasks at home. Since 2010, Oialla and Sumar hired 34 Bolivian women to process our cocoa. It might be a drop in the ocean but it ensures a second income and improved living conditions for 34 families. 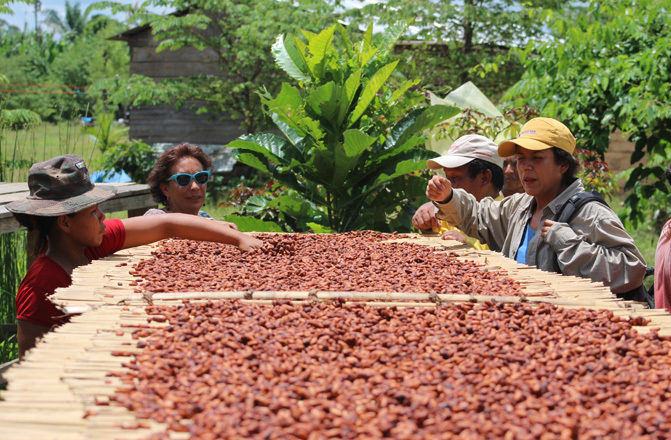 The cocoa processing is spearheaded by our partner Marcela Baldivieso while her husband, David Vacaflores, coordinates and oversees the harvest in the jungle. Oialla will be a part of the Women Deliver Global Conference 2016 in Copenhagen, Denmark – The world’s largest global conference on the health, rights, and wellbeing of girls and women.